The New York Giants have an interesting predicament at their hands, and as always, revolves around their No. 2 pick in the 2018 NFL Draft. They could go several different directions with the pick, but the options of taking a quarterback or Penn States’ Saquon Barkley lead the pack. The early consensus is that Rosen would fit the mold best for the Giants, as he brings precision, gusto, and a pocket passer presence in his game. But the other side of the story has New York sticking with Eli Manning for at least one more season, and allowing Davis Webb to test the waters. So in this situation, taking Barkley might be the best move, or at the very least trading back a few spots and praying to the football gods that he falls into their hands. The question is: What does Barkley bring to the table that makes him such an enticing pick for the Giants? 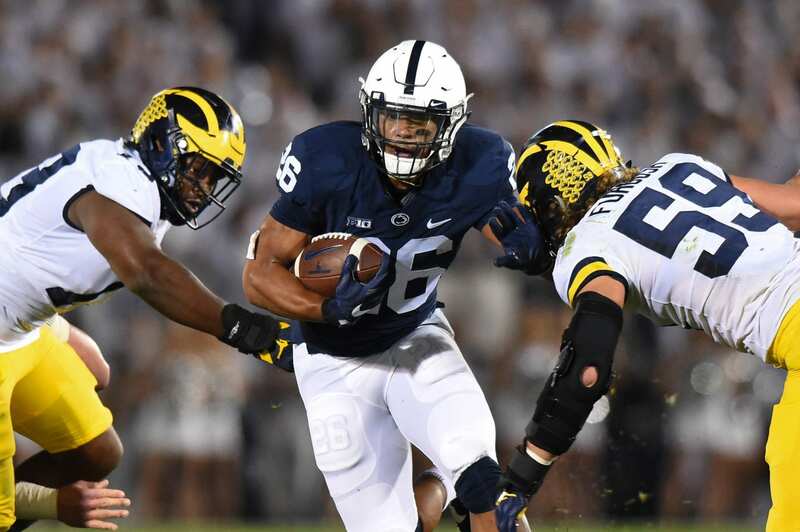 The Penn State running back compiled 1,271-yards in his junior year with the Nittany Lions, averaging 5.9 yards-per-carry in addition to 632 receiving yards. Let’s not forget to mention his 21 total touchdowns over the course of 13 games. It’s also important to note that he was the focal point of the Penn State offense, which caused defenses to heavily plan around stopping the dynamic back. So, what would he bring to the Giants? Barkley would be a god-send to an offense that lacks a true work-horse back and a genuine blocker to protect Manning from incoming edge rushers. Grabbing the stud runner would immediately provide an influx of talent in the backfield, and offer a dynamic talent to complement Odell Beckham Jr. In comparison to what UCLA quarterback Josh Rosen would bring to New York, Barkley would offer an immediate difference on the offense, while Rosen would likely sit a year or two behind Manning. Utilizing the Giants’ 2018 first-round pick right away gives Barkley the edge in this scenario, as his strengths extend to pass-catching and even splitting out wide as a make-shift receiver. New head coach Pat Shurmur would ultimately have a plethora of options at his disposal with Barkley as the starting running back. The Giants aren’t making a Super Bowl anytime soon regardless of who is picked, so why not take a franchise quarterback and plan for the future? If Rosen or any quarterback comes to New York and earns zero first-team reps with players such as OBJ, Shepard or the offensive line until 2019, it would already put him at a disadvantage. Logically, it would take him at least a full season to grow accustom to his teammates, which would inevitably waste two full seasons of OBJ’s mega-deal in which he will be making top-dollar (not to mention Andrew Norwell if he’s signed).